Within a few days we all left Libya to our destinations except Faruk and Rashid, Nimmi and me decided to go to London first, from there we shall go for Umra then Dhaka and from there to Piking(Beijing). The reason was to meet all the near relatives and friends before proceeding to new place of duty. After many hazards and uncertainity we got a direction at last! Many say aloud that Gen. Zia had rewarded us by assigning us as diplomats. However, The readers after going through what I had narrated would certainly realise was this a reward or a way to secure his lust of power!Even after this, there remain lots to be said. After postings when Gen. Zia from the blues suddenly placed our services permanently as encadered officers in The Foreign Ministry. This being a blatant violation of his commitment, all of us had tendered our resignations in protest against his unileteral decision. In our resignation letters all had stated that the condition to take up diplomatic assignment temporarily was that he would take back us in the army at the earliest. Trusting him, we had agreed to his request to take up our diplomatic assignments. As now, he had flouted his own commitement, we would be obliged should he accept our resignations. But Gen. Zia maintained absolute silence on this issue. 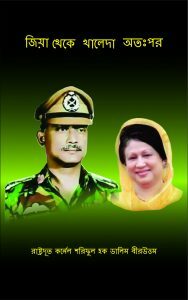 Having no reply from Zia, Col. Shahriar and Maj. Huda decided to return back to Bangladesh. On their return both were arressted and put to jail for about two years without any charge sheet or trial! Col. Faruk when tried to return, Zia had similarly put him also in jail without being charge sheeted or any trial! Besides, the sons of the soil who could easily shun the pomp and grandure of Pakistan Army, who could not be purchased nither by Indian, Provisional and Mujib’s Awami League governments, it is irrational and outragegious to think that Zia, who was our protégé and remained indebted to us for his survibal since the days of liberation war till he was brought to the centre of power would reward us any way! It only sounds like the good old proverb- ‘Elephants and horses got drowned and the bat says how deep is the water’(Hati Ghora Gelo Tol, Chamchika Bole Koto Jol). If he had ever rewarded any one betraying the national interest that is Sheikh Hasina. When Awami League was getting fragmented into peaces due to power struggle and was near to become history at that point of time Zia compromising with India brought back Hasina who had spent long eight years in India thoroughly brain washed by her ‘Kakus’ and ‘Mashis’ beeing her mentors to be the chair person of Awami Leage thus got her party rehabilited in the main stream of national politics providing all out support and resources. But in return of his ‘generosity’ the out come was Zia got brutally killed on the 13th day of her return. This was his befitting reward. On the other had, the whole nation has been gasping under the strangulation of the huge Anaconda named Hasina. To day, the people are realizing every moment how severe could be the pain of their bones and flesh being crushed inside the jaw of the huge Anaconda! It is time to ponder, who to be blamed for this measurable plight? After Umrah we reached Dhaka on our way to Piking. Knowing this Zia one day called me at his office. The way you desired to keep us Sir. While serving tea and bites Zia, played the old record once again. I have been happy that you all had decided to accept my offer. Special instruction would be sent to all the Missions through Foreign Ministry so that you being my trusted representatives can work to improve bi-lateral relations in every aspect keeping me informed without any hinderence. But, for tactical reasons overtly we have to maintain secrecy about this from both sides. All of you would have the privilege to maintain direct contact with me as and when required. Look Dalim, I should not be misunderstood by you all. The way we decided to follow that is not realistic that is why, I decided to charter a different course for the greater interest of the country and the nation. Nothing could be acheived in term of national interest moving ahead without national unity. Therefore, some consession one has to make at times, what do you say? Besides, I must also keep an eye to the aspiration and expectation of the out side powers. How can one withstand their pressure being opstinate? To take forward a war ravaged country towards progress their help and assistance are also needed. In the present age of ‘Global Village’ is it fruitefull to adopt the policy of ‘Go Alone’? All these matters are not difficult for you all to understand. I hope, like in the past I shall be getting your sincere support and co-operation in future as well. Sir, I don’t think it is necessary to discuss about all these anymore. Now, you have chosen your own way. In your way we all are irrelevent. However, as you have raised the topic, I would say a few words. As the under developed countries in to day’s world can’t move ahead with out the help and assistance of the powerfull countries similerly, those powerfull countries also need the ubderdeveloped countries for various reasons. It had not been possible for any leader to acheive absolute unity of the entire nation to take forward the country towards progress, to administer the state or for that matter to take any decision for bringing fundamental social changes. That is why democracy and democratic mind set stand on majority. Besides, any combine that is established in the name of unity shaking hands with the enemies of the country and the nation had always proven to be fregile and at places seriously damaging. Serving the interest of the greater majority of the people and that of local vested interested coterie and the foreign powers simultaneously was not possible for any leader of any country of the world historically. Should you be able to do so then that would be an astonishing discovery added to the history of political science. Personally, what consequence you would face trodding your chosen path only future can say that. But the result of your decision of welcoming Hasina, the Anaconda back to Bangladesh for whatever interest it might be, would pose a threat to the separate existence of the country and the nation. Sir, you have to understand the sturk reality that India would be the biggest impediment on the way to establish Bangladesh as a progressive, self relient and prosperous Bangladesh. They would never allow Bangladesh to emerge as an independently prosperous country no matter how much concession you make. In times ahead you would also notice India taking measures in connivance with its foreign allies to sub-due or disintrigate Pakistan to fullfil its hegimonistic claim on the Sub-Continent though Pakistan is a neuclear power. Reason being, the question of very existence of Indian Union is directly related with this. If ever Bangladesh emerges as a state of that kind, then Indian Union, an artificial creation of the British would fall apart into peaces in the light of Bangladesh. In view of this, we wanted to rebuild Bangladesh as a progressive, self relient, prosperous and viable state. There is none but only one way to achieve this goal. That is to initiate a pro people politics to meet the aspiration and necessities of the majority of the people. By doing so, we would have gained their confidence and support and basing on that national streanth it would have been possible to move forward towards progress and prosperity by taking revolutionary steps with self-confidence and courage ignoring the bloody red eyes of India. In no way this goal can be achieved doing politics with the vested interested quarters. Simultaniously, it would be prudent for us to provide sincere moral, political and diplomatic support to all the on going independence movements of ethnically different nations within India as our conostitutional obligation. For the sake of Bangladesh’s independent existence and economic growth, it is imperative that it should also establish a sincere and friendly relation with one of the growing power China in view of its geo-strategic positon to counter Indian challenges. Being the near neighbor People’s Republic of China in their own interest is also well aware of this reality. But how deep would be the relation of China with your government that would be decided only after you are measured on their scale. However from my side there would be no darth of efforts from my side. Now, if you allow then I would like to beg leave Sir. I am saying it again, if beed be don’t hesitate to contact me directly. I came out from Gen. Zia’s office. Zia had chosen the wrong path to go along betraying his tested comrades. The end result of that would not be palatable that is what I tried to convey him indirectly. Whether Zia had registered what I wanted to convey or not that is his business not mine. There after, Shishu Bhai invited us over a fare well dinner. This time the atmosphere was different as Nimmi was with me. Shapan, Mohua and Keya were also invited. Besides, my shadow companion Col. Mahbub was also with us that made the occasion all the more enjoyable. You all have chosen your path, now, tell me what would be right for me to do? Your way already has been decided. Once you get the immigration papers in hand you would fly off to America if meanwhile, the lust for the seat does not change your mind! Having said so we all burst into laughter. Please, don’t ask me that. I thought it was a farewel call. But he vertually took a class trying to prove that all his actions so far taken were justified! Didn’t you raised any question? Are you mad! But only tried indirectly to make him realise that it is not possible to remain in peace with a mole on Achill’s hill nor it is possible to go very far. So long we were at Dhaka, we remained busy with dinners and parties thrown by the relatives and close friends. Thats why our time passed away in hilarious enjoyment and lots of fun.